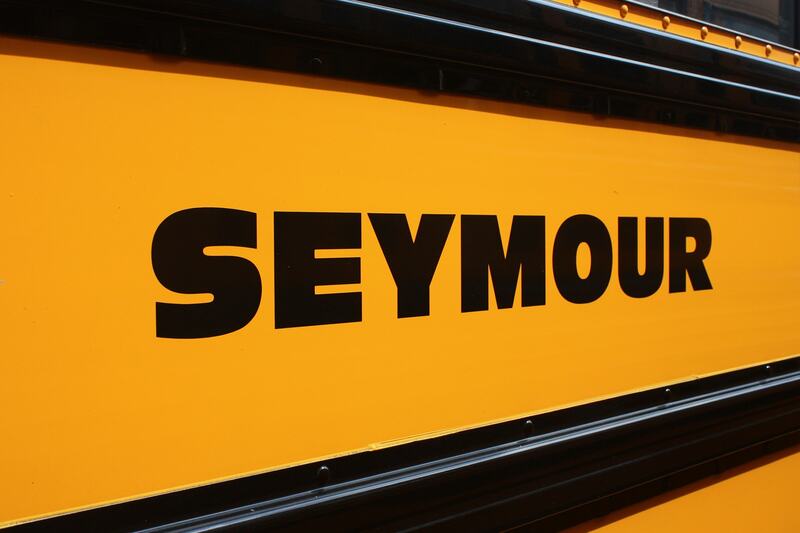 The school bus routes for the Seymour Public Schools are listed under the school that your student will be attending. You can find bus routes here and then click on the Transfinderi.com link. Parents should check the school district website for information about early dismissal days (for example: conferences and early release days). Here is the Seymour Public Schools calendar. For questions or additional information contact Patricia Boyle at the Seymour Board of Education at [email protected] or by phone at 203-888-4564, Ext. 1902. You can also visit the Seymour Public Schools transportation webpage. NOTE: Bus schedules are subject to revisions that result from enrollment changes, transfers and address changes. Changes and / or additions will be posted to the school district’s website and residents are encouraged to frequently check the Seymour Public Schools website. Seymour High School – 7:30 a.m. – 2:00 p.m.
Seymour Middle School – 8:00 a.m. – 2:30 p.m.
Bungay School – 9:00 a.m. – 3:30 p.m.
Chatfield-LoPresti School – 9:00 a.m. – 3:30 p.m.
Seymour High School – 9:30 a.m.
Seymour Middle School – 10:00 a.m.
Bungay School – 11:00 a.m.
Chatfield-LoPresti School – 11:00 a.m.
Seymour High School – 11:00 a.m.
Seymour Middle School – 11:30 a.m.
Bungay School – 12:15 p.m.
Chatfield-LoPresti School – 12:15 p.m. The buses traveling out of Seymour run on the Seymour Public School’s schedule. Weather conditions in Connecticut may vary dramatically from town to town. All-Star Transportation will ensure safe transportation for all students. For delayed openings and cancellations due to inclement weather, please listen to local radio and television stations. Emmett O’Brien students ride buses 30, 35, and 41 in the morning and buses 30 and 41 in the afternoon. Students are picked up at assigned bus stops and transported to the Seymour Community Center. There, students on buses 35 and 41 transfer to bus 30, which transports the students to Emmett O’Brien. After school, students are dropped off at the designated stops they used in the morning. Platt students ride on buses 30, 35, and 41 in the morning and bus 35 in the afternoon. Students are picked up at assigned bus stops and transported to the Seymour Community Center. There, students transfer to a bus (35) that transports them to Platt. After school, students are dropped off at the designated stops they used in the morning. Any individual seeking a change to a student’s pick-up and / or drop-off procedure must contact the main office at their student’s school. However, for grades 1 through 5, if a parent or other authorized adult/care giver that is usually present when a student is dropped off is not there, that student will be brought back to school. If a student is uncomfortable when getting off at his or her bus stop, that student also will be returned to school. It is advisable for parents to inform the school if they want their student to be dropped off at their bus stop without an adult being present. 3. Students should wait for the school bus to come to a complete stop and for the doors to open before approaching the bus.